As an art student, Martin Hudáček of Slovakia was moved to create a sculpture to draw attention to the devastation abortion can bring to the woman, and to the fact that through the love and mercy of God, reconciliation and healing are possible. 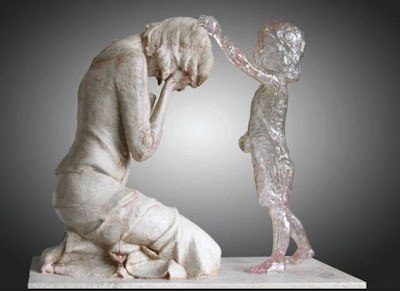 The sculpture shows a woman in great sorrow grieving her abortion. The second figure in the work is the aborted child, presented as a young child, who in a very touching, healing way, comes to the mother, to offer forgiveness.